Contrary to what is often thought, camellia is a robust and easy to grow plant. However, it may know some disorders. Here is a brief statement of most commonly encountered diseases. The buds are a sign of good health. If their growth is regular from one flowering to another, everything is normal.The more a camellia grows, the more it flourishes. If the growth of the buds is abnormally slow or if they end up falling, you must seek for the cause. 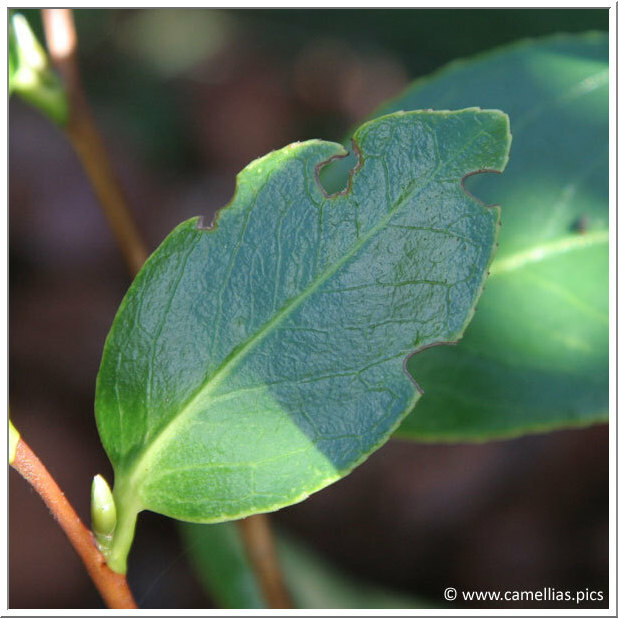 The camellia can be lacking of sunlight (a camellia must have a minimum of sun to bloom, quantity to adjust depending on the region and the species or variety). It may also be "hungry" because of a lack of fertilizer or a poor substrate. The fertilizer has to be given in the spring. I complete the peaty soil in spring and late summer. I repot the camellias in pots in spring. A camellia needs water. If the water supply throughout the summer months is not enough, the buds will struggle to grow and are likely to fall. The quality of the flowers will also be compromised. If a winter or spring flowering camellia has its flowers fall, it means that it ran out of water during the spring or preceding summer. Pay attention to the thermal shock, which often occurs in summer. You forget the camellia and the soil dries, then you hasten to water and you see the buttons fall. You must leave a sprinkler (a cone and a bottle will do the trick) and especially water gradually during drought. You will probably lose some leaves, but future flowering will not be totally compromised. 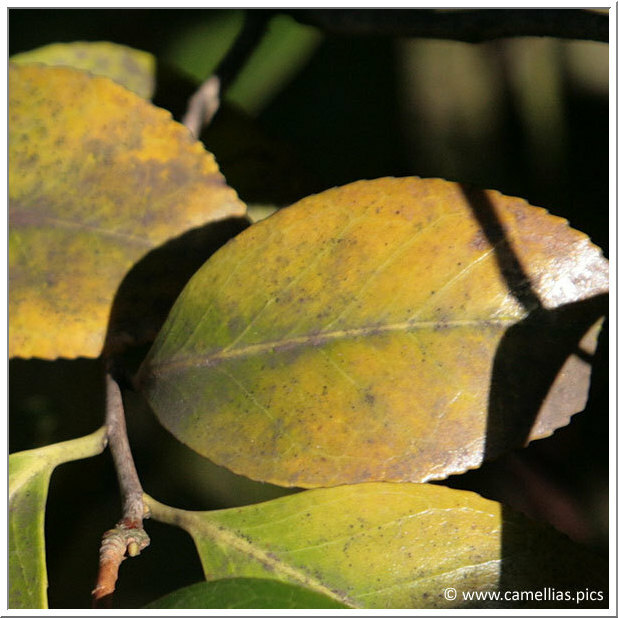 If the buds fall occurs in winter, the camellia is probably exposed to a morning sun. Their is nothing worse than the sudden transition from freezing to thawing for buds. A morning sun after frost can ruin the coming flowers. In this case, you must review the exposure. Both are as bad as one another. Drought can cause leaf and buds fall. 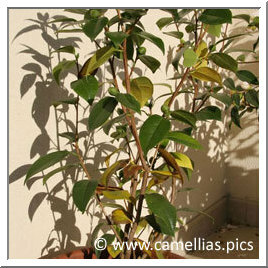 This will be mulching the base of camellias, whether in ground or in containers. You must monitor the watering, the soil should always be moist but not too much. In summer, warm evenings, give the camellia a shower. They love humid climates. Just wait until their are no longer exposed to the sun, so as not to burn. 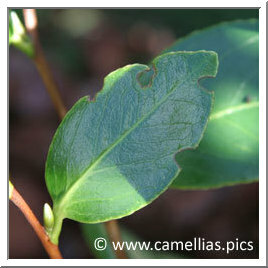 Conversely, excessive watering can kill a camellia. 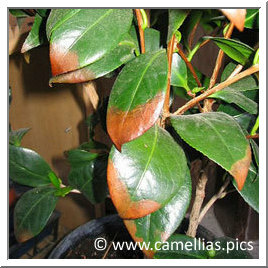 Camellias in containers are particularly vulnerable. We always try to do well and, after purchase, we tend to repot them in a too large container. Do not choose a container with a diameter more than 2cm larger than the former. If the container is too large, the water will stagnate, and will form a kind of gruel and will rot the roots. It can go very fast. If the leaves get yellow and fall, check the drainage of the container and its size compared to the mound's. A a bit smaller container and limited irrigation may be sufficient to stop the process. Another consequence is a slowdown in buds growth and a poor flowering. Similarly, a soil that does not drains adequately can generate the same problem. In this case, you just have to to find another place or grow it in container. We have just mentioned in the preceding paragraph. Drought and excessive watering are responsible. The use of a winter veil can have the same consequences. The camellia is much cold hardy than we think. Frost is not necessarily a problem. Everything depends on its duration and intensity. We discussed this in detail in the Camellia care page. It is better not to use fertilizer rather than using the wrong ones. 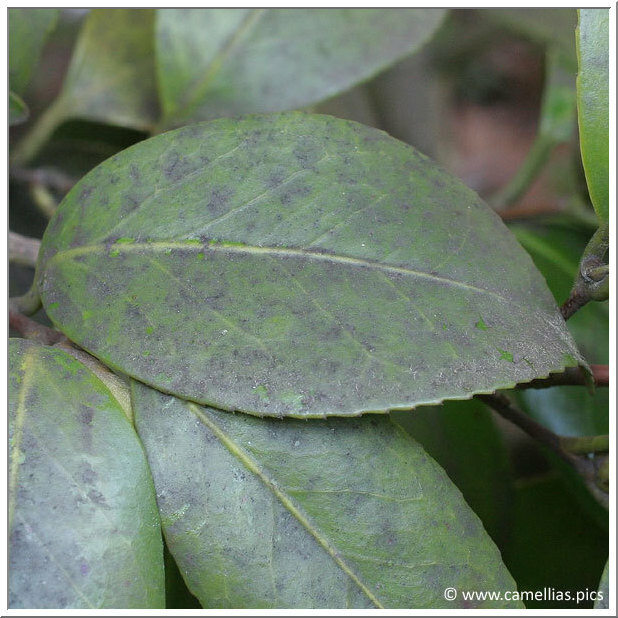 There are camellia fertilizers, with or without slow diffusion, as well as organic fertilizers that suit them (eg dried blood). The fertilizer has to be used at the end of flowering and in limited quantities. For camellias in containers, have a light hand. Poor absorption of fertilizer causes brown spots on leaves. In taht case, their is nothing much to do. Similarly, insufficientwatering during high heats can have the same consequences. Either the leaves turn brown, either they fade and turn yellow. Therefore, avoid too hot exposure, especially along a wall exposed to full sun. The only solution is to find a more sheltered place. It is a black deposit that can be seen on the leaves. It is caused by aphids or cochineal insects. Apply the appropriate treatment. You can then clean the leaves with soapy water. The most often invoked disease ... or suspected ... Because of lack of iron, the foliage fades. Some fertilizers make solve this problem (like dried blood). Treatments exist. It is often said that the hard water used for irrigation induce this problem. Everything depends on the hardness of your water and the proportion used for irrigation. 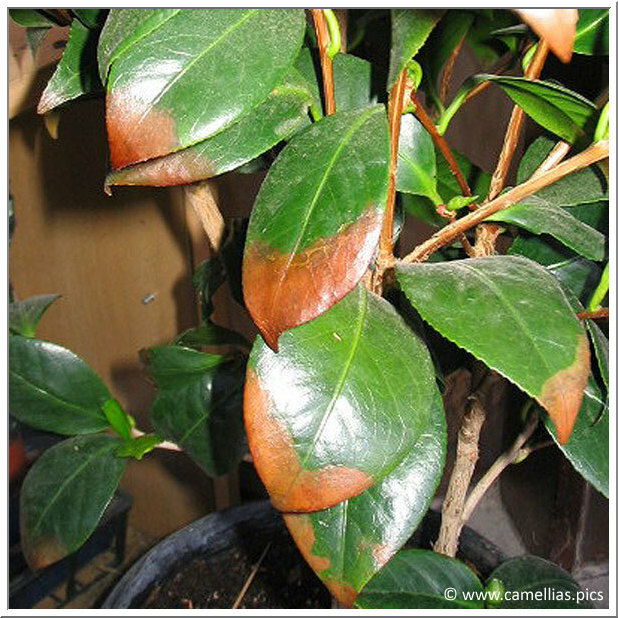 I have soft water, so my camellias do not suffer from chlorosis and I water them as often as possible (I also shower them as much as possible).Chlorosis can also be due to poor substrate. In this case, you can grow the camellias in containers. Generally, to acidify the soil, it is good to mulch the foot with pine bark. Mulch helps keep the soil moist and protects the roots from the cold. If the end of the leaves looks like the right picture, do not panic. This is not very aesthetic, especially on a young camellia. The vine weevil is active at night. It will disappear at fall. Needless to treat or to hunt after dark. If they are too invading, you can use a dedicated treatment. To summarize: watch regular watering, the leaf color and buds condition. 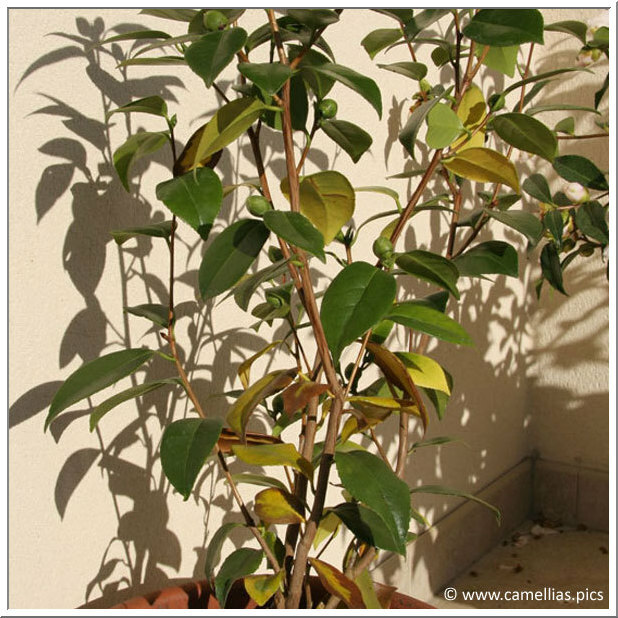 An healthy growing camellia produces buds and keeps a bright and colorful foliage.